Welcome to Waterfalls of Ontario! 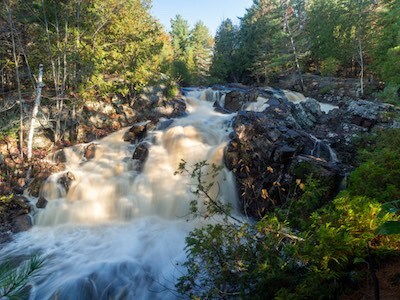 This web site is about visiting and enjoying natural waterfalls in Ontario, Canada. Waterfalls are great places for hikes, photography, family outings, or just to find a way to reconnect with nature. This is the 6th edition of this web site. The first was uploaded in 1999. The site compliments the 262-page, full colour book published by Firefly Books (click the book cover for more details). There is also a Facebook Group that is almost 4000-strong, as well as a growing Youtube Channel. If you are new to exploring waterfalls, please read through the tips below. This includes the Waterfall Safety Page. 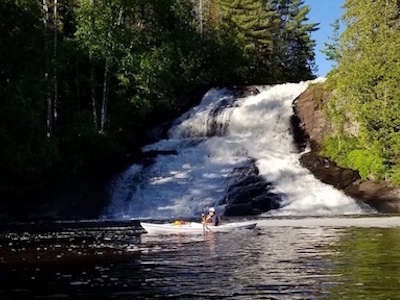 Most natural waterfalls in Ontario are located on public lands. This means that you can visit them at almost any time. Some are located in parks with closing hours, and some may require an admission. But the majority are free to explore. Waterfalls come in all shapes and sizes. In some cases you will be awestruck. In others, you will be asking "That's it? You're kidding, right?!" This is where this web site comes in handy! The Regional Guides will help you to know what to expect. Almost all of them can be dangerous if you aren't careful! Some have signs, parking lots, fences, shelters… others have nothing! …others are only reached by helicopter! 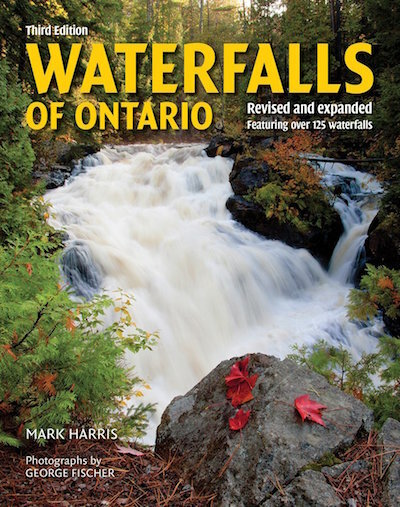 The 500+ waterfalls in Ontario are spread across the province. They aren't found just anywhere, and you may need to travel an hour by car in order to find one. That's where this web site comes in handy! You can pick a waterfall region from the Waterfall Guide , or look at a big Google Map. For many causal waterfall visitors, summer is the time of year when they come across a waterfall. While this is certainly the nicest time to be outside, waterfall visits in summer can sometimes be disappointing. The streams and rivers that flow over waterfalls are usually at their lowest levels during this time. Depending on the falls, it may drop to a trickle for weeks on end. More experienced waterfall enthusiasts know that spring and fall are often the best time to visit. Stream flows are higher, and the harsh shadows cast by thick vegetation are absent (see Photography Tips). Winter can be an interesting time to visit too, with some waterfalls morphing into frozen wonderlands. In most cases, you will need a car to get to Ontario's natural waterfalls. If you live in the city of Hamilton, Owen Sound, or even Ottawa, you are luck in that you can visit some waterfalls by city bus. The more popular waterfalls may have paved parking lots, good signs, and sturdy boardwalks to make visitng easy. 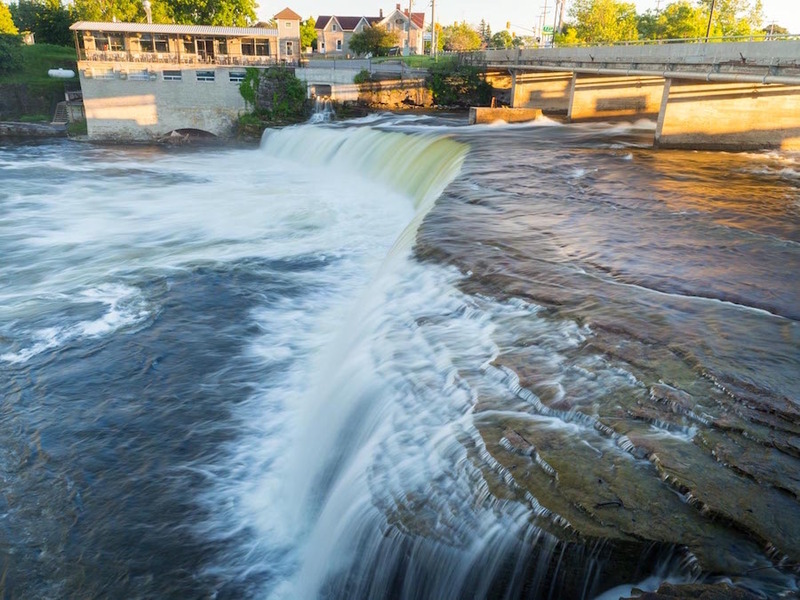 The shot of Fenelon Falls, above, was taken from a sturdy concrete overlook, just a few steps from the sidewalk. Much more often, you will need to do some hiking to find some of the lesser-known (but equally rewarding) examples. 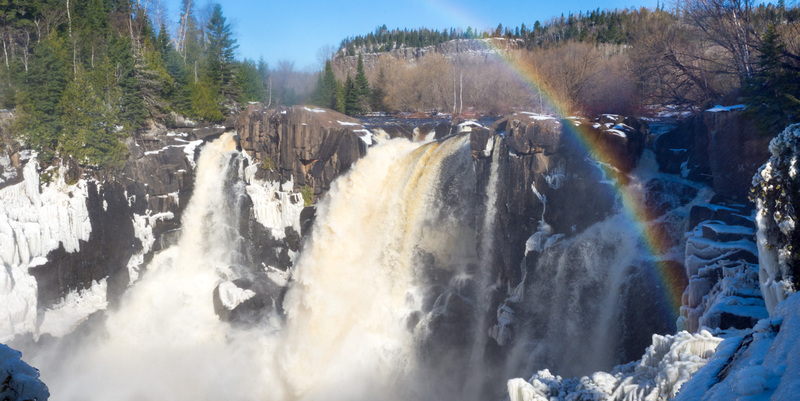 The shot of High Falls, below, is taken after 2 km hike along Eels Creek. In these situations, you will need good footwear and be ready to follow unmarked paths. In some more extreme cases, be prepared to get dirty! Waterfalls can be surrounded by wet, muddy terrain, and usually have steep slopes. Each waterfall featured on this web page is accompanied by a short description and a photo. If a photo is missing, or is grainy, that means that I need people like you to send one for the web site! In addition to a Google Map, there is also a button that you can press to give you Google driving directions from any location. Each waterfall also has rating, between one and five stars. Sites with 5 stars are sure to impress anyone. They are usually larger, have reliable flow, make good pictures and offer lots of hiking opportunities. Sites with one star are likely to be disappointing to most people. They are generally very small, aren't photogenic, and may not be fun to visit. This is all subjective of course: eg. the differnce between 2 and 3 stars is debatable. You will also note that there are green, yellow, and red stars. Yellow stars signify that the waterfall is accessible by land, but many people will experience some challenge in getting to it. This may be due to rough terrain, a long hike, or the lack of a path at all! Yellow sites are not for kids or people with mobility challenges. Visiting these sites is more risky. Red stars mean that you cannot access the waterfall by land. You may only need a short paddle downstream or a quick boat ride to the other end of the lake. But there are also many waterfalls that are very remote, and are not possible to visit without special preparations. Please use caution and research these thoroughly. Note: If I don't know whether a site can be safely visited, its rating defaults to red. Region: For convenience purposes, the province has been broken into 8 regions. But you should be aware that waterfalls near the edge of one region might be very close to other ones in the next region. So be sure to consult the Maps too, especially if you are near the border of a region. County: Ontario is broken into a number of jurisdictions that can be called counties, regional municipalities, or districts. To keep things simple, I refer to them all as counties. Again, this is for convenience purposes. The same tips apply above about referring to the maps as well. Near: This identifes the community that is nearest to a waterfall. It helps you to find the general area on a map. This is a bit of a holdover from the days when we didn't have Google Maps and Google Directions. But it's still useful at times. River: The name of the river or creek on which the waterfall is located. In some cases, the falls is located between two lakes, and an awkward name is used, like 'Pine Lake to Silver Lake.' Note that some small creeks don't have an official name. Type: Waterfalls come in different shapes. Sometimes the water plunges straight down like at Niagara Falls, and other times it cascades over bare rock at 45 degrees, like at Rainbow Falls. This heading gives you an idea of the style of waterfall. Size: A subjective description of the size of the waterfall. I have purposely avoided classifying waterfalls based on height. Too many people use the height as some sort of rating system. This is very, very misleading as many small waterfalls are more scenic and enjoyable than larger ones. Coordinates: Latitude and Longitude values that you can punch into your GPS. You can copy and paste these two values (include the comma between them) into Google Maps or Google Earth. To make it easier, you can click on the 'Google Directions' link below the map. Parking: As of July 2018, most of these are blank. Google coordinates will show you where the waterfall is located, but not where to park. In some cases, this isn't a problem because the waterfall is right beside a parking lot. In other cases, you will need to follow a long trail. Google's Directions won't know where to tell you to park you car, and may send you to an entirely inappropriate location. ie. you might be a kilometre from the trailhead. This will be built up over time. Rating: This is the same three-colour, five-star rating system explained above. CBC News, June 13, 2017. 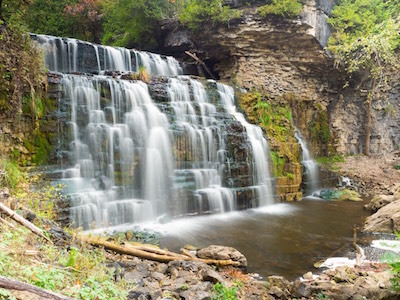 "Man killed at Albion Falls slipped while taking photographs." CBC News, July 24, 2017. 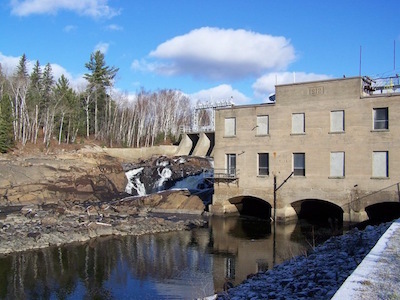 "Man, 19, falls to his death at Eugenia Falls." CTV News, June 17, 2018. 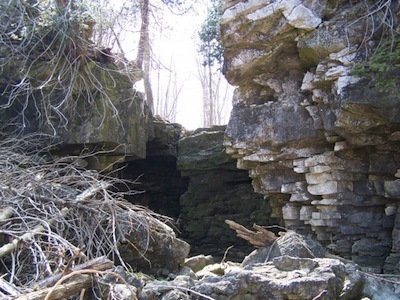 "Woman caught in rocks at Ontario waterfall dies in hospital." Sadly, there are more cases. These stories aren't meant to discourage you, but they are meant to stress that you need to be careful. If you use your common sense, you will be fine. So before you get started, please read the Waterfall Safety Page. You do also need to be aware of private property.